'Shop Contest: Exposing Captain Toad's Crimes, Winners! This was an action-packed week of ‘Shop Contest because you all were hunting down the known criminal Captain Toad and demonstrating all of his wickedness. And, by golly, we’ve proven how truly depraved he is. Last week I asked you to show me the crimes that Captain Toad has done, and you gave me a cavalcade of badness, inside and out, that I can’t seem to shake. A whole network of criminal behavior. It’s unbelievable. Our winner this week (in a very hard and impressive category) is alexm, whose take on Toad implies some stolen identity work that’s truly reprehensible. I encourage you to go to the original comments to see all of the entries, especially the double and triple entries, because y’all do some really excellent ‘shop work. I’ve selected some honorable mentions to highlight because I liked them, or because they made me laugh, or because they were unique takes, but honestly everyone did a very impressive job this week. Big up to you all! Without further chatter, here’s some great honorable mentions! Mortal Dictata wanted Toad to choose life, and I’m pretty sure he will. He’s stealing diamonds so that he can afford a nice couch, after all. NegaScott128 puts Toad right ahead of the ball, so to speak, and you’ve got to hope that he helps Indiana at the end. For cecil_banon, Toad is only out for himself. Typical. ZMAN2018 shows us the terrible post-crime Toad who will not do the time. He did the crime, though! netsquire reveals that Toad is a multi-dimensional thief. The greatest thief in the multiverse?! truks provides a revelation that I just cannot handle. It was Toad the whole time! And in a rare double acceptance, truks hints that Toad might be the one who knocks. CBM86 proves that Tucker and Dale are both innocent, and it’s that damnable mushroom who is to blame. Bob delivers the goods that Toad never managed to deliver in this dramatic retelling of a family tragedy. Villings makes it clear that there are several top villains in this universe, and Toad is one of them. Urambo Tauro proves that Toad can work with the good guys every now and again, though. Following soapypickles, one might even say that Toad is a guardian...of what, though? Katjeluna troubles the Toad narrative by suggesting that he has a bank-robbing brother. 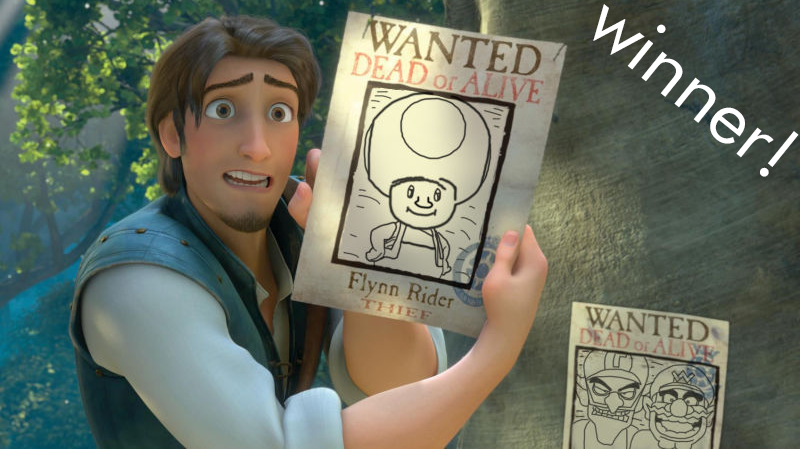 Which is where Toad learned the worst crime possible, which amazingmao has alerted us to. I don’t have a joke here, this is just a straight-up reference to the movie Congo by MegaBuster87. Brandilioni proves that Toad has no respect for the living or the dead. sciteach knew it was the dastardly Toad the whole time! Bringing up the rear with a slam dunk, Done With Kinja knows what Toad is really all about.